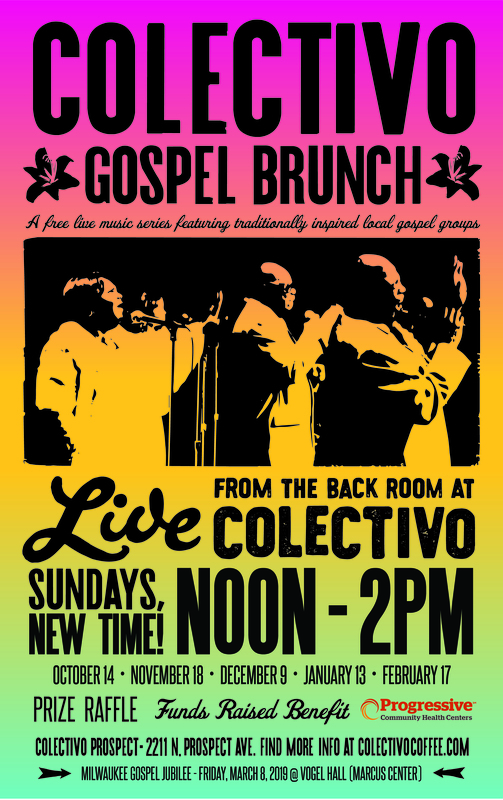 Join Progressive Community Health Centers in the Back Room at Colectivo Prospect on select Sundays for this free, live music series. Brunch events feature traditionally inspired local gospel groups and happen monthly leading up to Progressive’s 6th Annual Milwaukee Gospel Jubilee at the Marcus Center for Performing Arts on March 8, 2019. Enjoy sneak peek performances with a rotating lineup of Milwaukee’s top gospel groups in the quartet tradition. Food and beverage available for purchase. Raffle proceeds and t-shirt sales benefit Progressive Community Health Centers. Learn more at www.milwaukeegospel.org.